In the year 2018, the digital habits of consumers have changed drastically. The way our potential leads consume and discover content is completely different than it was even a year ago - your audience demands video content. But why should you dedicate your time to this specific type of video content? Webinars are an easy type of video to produce, and their longer length allows you to share a lot of information about a certain topic. The average webinar attendee views a webinar for 61 minutes (source) - that's a long time to hold a potential customer's attention! - Webinars work across multiple stages in the sales funnel. From panel discussions to live product demos - this particular type of video content can effectively relate to each stage in the buyer's journey, and help move the potential leads down the funnel. - Webinars generate higher quality leads. To enter a webinar, the prospect must submit their contact information to register with your company. And someone who is interested in watching a webinar is already leaps and bounds ahead of other leads - they're invested, and ready to put the time to learn more about your product or solution. You can't possibly be a pro at everything - so choose a specific content idea, which you can delve into deeply. Going this route will help keep your webinar focused, and will minimize the chance of going off on tangents; because when you ramble on, you lose your audience. Webinars need to feature a host who is skilled in and knowledgeable on the specific top that you're discussing. And unfortunately, some people have charisma on camera, and some don't. Camera coaching can only go so far, so be selective with your speakers. How will you need to set up the cameras and equipment - do you plan on having a single presenter? Or should you host a panel? Or should it be two people asking and answering questions? The format dictates the production. And there is no one-size-fits-all solution for the format - it really depends on the topic. Will your chosen topic be search engine-friendly? If so, consider upping your production game so when consumers stumble upon your webinar, they're impressed. 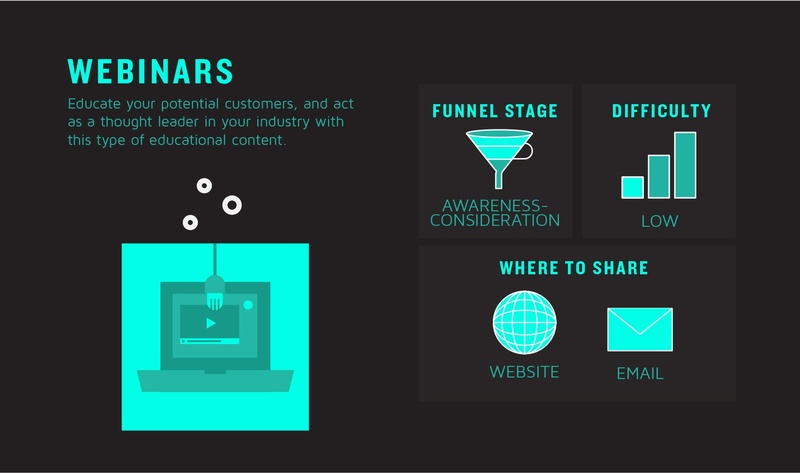 And if you need a little help to get eyes on your video, how do you plan on sharing your webinar so your potential target can find your content? And, transcribe, transcribe, transcribe! Just like with any video, a webinar requires a script. Given the interview style format or the lower formality of the speakers in this video type, you may think that you can skip the script. But, scripting is key! Talking for an hour on any subject, no matter how much you know about it, is difficult. You must stay on-topic and track your time. Even if a viewer is engaged for 61-minutes, you still need to keep it under control, minimize mistakes and avoid repetition. If no one is able to hear what you say, what's the point? When you work with a video production pro like Pop Video, we provide professional sound equipment to capture every audible moment, so your webinar, or any other video, won't skip a beat. Ideally, your webinar would be produced in a studio space, but regardless, ensure all cell phones are turned off, computer notifications and sound are muted, and remove anything else that could distract you.